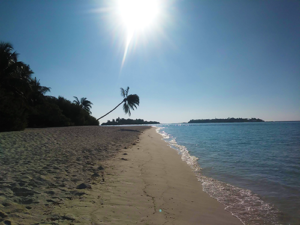 What a fabulous holiday we have had at Sun Island in the South Ari Atoll of the Maldives. The journey is not for the faint-hearted, with two international flights, a domestic flight and speedboat involved but it is so worth it! You are given a warm welcome on arrival – the hospitality from all staff is incredible throughout the resort. 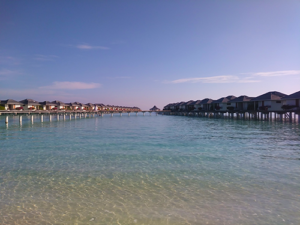 Accommodation comprises of water bungalows, superior beach bungalows, beach bungalows & sun villas. You can’t go wrong with any of them – the sun villas don’t have a beach or ocean view but there is a large pool area overlooking the beach to use too. The food is excellent with choices of seafood, pasta, a variety of curries, salads and delicious desserts in the main restaurant and separate Thai & Italian restaurants, both at the end of jetties where you can look at at the amazing marine life.This is the only time you will ever realise there are plenty of others are on the island with you! The water bungalows have a separate restaurant and are less busy. 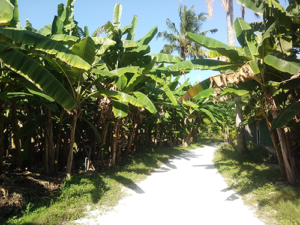 The organic restaurant in the middle of the island has a tree house you can book to dine in and is adjacent to the banana plantations & greenhouses where a lot of the island’s food is grown. If you don’t want to sunbathe all day, there is plenty to do. The island is the biggest in the Maldives (which is only roughly a mile in length!) so you have an option to hire bicycles to get around if you wish to be more active. There are daily activities laid on by the entertainment team including yoga, belly dancing, salsa, bachata, aqua gym, zumba & a night time schedule of Maldivian dancing, fakir, local bands, go-go & belly dancing. If this is not your thing, there is a beach bar at the other side of the island for a more laid back vibe in the evenings. 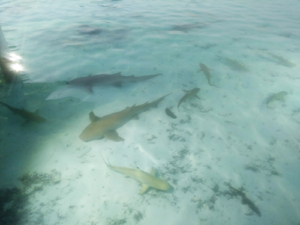 The sea is warm, crystal clear & full of a vibrant array of fish, rays and reef sharks – many coming in to the shallows so if you don’t wish to snorkel you will still get plenty of photo opportunities! A must is the reef shark & sting ray feeding sessions which happen nightly. Other amazing creatures you will see are fruit bats, iguanas, storks & tiny geckos and crabs & if you are lucky you may spot a sea turtle. There are plenty of excursions to neighbouring islands or to swim with sharks (they”re friendly!) or go dolphin watching. F or those wanting to indulge, the Aaramu Spa is a beautiful place with such a choice of treatments you don’t know where to start. 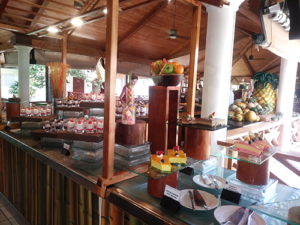 Just to point out that any extras do not come cheap on the island so you may want to go full board for all your meals to be included in the main restaurant or all inclusive to include some drinks into your package. This though truly is paradise – you will fall in love with the place & the people that work so hard there to make your holiday special. Thanks so much Maggie for booking this trip for us – once again we have had a fabulous time with Travel Wallet’s first class service.